In this video we will learn about, INSTEAD OF triggers, specifically INSTEAD OF INSERT trigger. We know that, AFTER triggers are fired after the triggering event(INSERT, UPDATE or DELETE events), where as, INSTEAD OF triggers are fired instead of the triggering event(INSERT, UPDATE or DELETE events). In general, INSTEAD OF triggers are usually used to correctly update views that are based on multiple tables. We will base our demos on Employee and Department tables. So, first, let's create these 2 tables. So, inserting a row into a view that is based on multipe tables, raises an error by default. Now, let's understand, how INSTEAD OF TRIGGERS can help us in this situation. 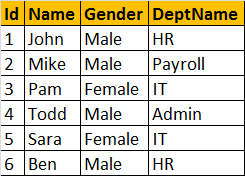 Since, we are getting an error, when we are trying to insert a row into the view, let's create an INSTEAD OF INSERT trigger on the view vWEmployeeDetails. The instead of trigger correctly inserts, the record into tblEmployee table. Since, we are inserting a row, the inserted table, contains the newly added row, where as the deleted table will be empty. In the trigger, we used Raiserror() function, to raise a custom error, when the DepartmentName provided in the insert query, doesnot exist. We are passing 3 parameters to the Raiserror() method. The first parameter is the error message, the second parameter is the severity level. Severity level 16, indicates general errors that can be corrected by the user. The final parameter is the state. We will talk about Raiserror() and exception handling in sql server, in a later video session. So, how does this trigger work for a thousand rows at a time, i.e. when some departmentid's are new and some are not (arbitrary order)? Sir, Can we Perform Instead of Insert Trigger on Table Having Identity property??? Thanks Venkat this is the best example I could come across with instead of trigger, God bless you. thank you so much. that helps a lot. for the guy who provides us with the query in the comment above, I see it's the same thing. Thanks for posting video and written text. I prefer reading text. However, videos are equally helpful.